"This is a delicious recipe combining apples, sour cream, sugar and a few others--to make a scrumptious dessert. I highly recommend that you use a high quality sour cream-it really does make the difference." Preheat the oven to 425 degrees F (220 degrees C). Press the pie crust into and up the sides of a 9 inch pie plate. In a medium bowl, stir together 3/4 cup sugar, 2 tablespoons of flour, and salt. Mix in the sour cream, egg and vanilla until smooth. Add apples, and stir to coat. Scrape the mixture into the pie shell. Bake for 15 minutes in the preheated oven, then reduce heat to 350 degrees F (175 degrees C), and continue baking for 30 minutes more. While the pie is baking, prepare the topping in a medium bowl. Stir together 1/3 cup of flour, 1/3 cup sugar, and cinnamon. Cut in the butter until the mixture resembles fine crumbs. 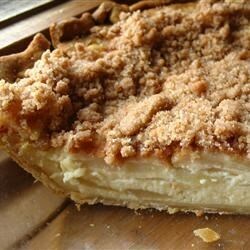 After the 30 minute bake time has passed, cover the top of the pie with the crumb topping, and continue to bake for 15 minutes, or until topping is lightly browned and apples are tender. Allow the pie to cool, then refrigerate until chilled before serving. This is good stuff! One of the easiest recipe I ever made... But I think have to increase the flour to maybe 3/4 cup for it to resemble fine crumbs. Otherwise, it is great! Everyone really loved this dessert, but I doubled the topping. Finally getting around to reviewing after all this time!